Maurice Ashley is featured in the March 19th edition of Jet magazine in a Black History segment. The commemoration marks the 8th anniversary of Ashley earning the GM title. The Brooklyn-based Grandmaster has been working on a couple of book projects to follow his successful "Chess for Success" effort. Johnson Publishing Company, the owners of Jet and Ebony magazine, have historically given attention to chess players and have featured Ashley's story in previous years (Ebony-July 1999). While Ebony, perhaps America's most influential Black publication, carries more mainstream topics, Jet magazine continues to provide morsels of interesting Black history facts for its readership. 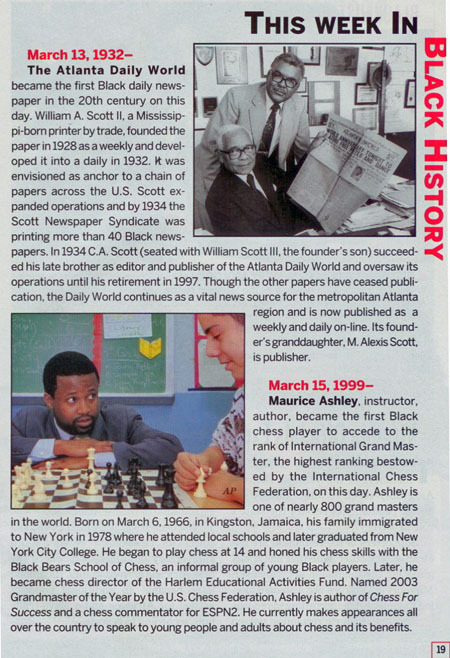 Jet's inclusion of Ashley as a historic figure is vital and hopefully chess will gain more exposure in other magazines as the public learns more about the tremendous accomplishments of Black players around the world.